You may have read that German cities have been witnessing public marches and demonstration around the question of immigration. Starting in November with a bizarre little huddle of neonazis on the steps leading down to Dortmund railway station, via Facebook rallies have been called and have grown massively calling for an end to immigration and also to the presence of the existing muslim minorities in Germany. The organising kernel of neonazis have clothed themselves in Christian garb and call for an end to religious intolerance, using the useful public face of the Salafist fanatics who handed out copies of the Koran and engaged youth in conversation and later clashed with the police, this has allowed the neonazis to whip up passive anti-muslim feeling into street marches under the weird archaic banner of Pegida, the partiots against the islamification of the west. To their credit, many thousands of liberal, left and progressive citizens and groups have taken to the streets to oppose those marches. The echos for each side for differed wildly. On balance there are now far more anti-Pergida marches than the rightwingers. 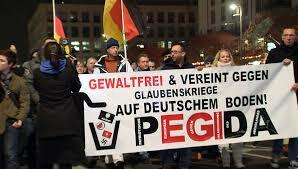 Last night in Cologne 5000 antis opposed 700 pros. After a long delay the political parties have condemned the strange populist grouping. And the deacon in charge of the mighty Cologne cathedral, following the example of the Opera in Dresden, plunged the centre of the city into darkness by switching off the cathedral illuminations. Having listened to her advisors for 3 months who point out that immigration is essential for the German economy and the financial health of the nation’s budgets and pensions, Merkel has finally made a public statement opposing the right. 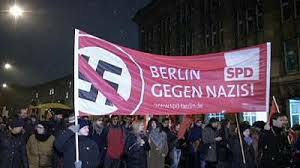 In nearly every part of Germany there is huge resistance to the rightwing demos. Munich in particular but also Berlin, Hamburg and Düsseldorf have held huge public demonstrations supporting multiculturism and defending the minorities. In truth the rightwing groups are confined to very few places. Their main support is Dresden where yesterday allegedly 18000 demonstrated for Pegida. This city has had an NPD group of councillors and regional parliamentarians for over ten years; these behave like thugs inside and outside the parliaments, carrry weapons and most have been in jail for violence. Leaning on the depressed economy of the border areas, they have a certain base in the population of around 4-5% of the voters. These NPD voters plus a number of supporters are the ones marching. The city, on the extreme eastern border of Germany, laughably has only 2% immigrants, probably the lowest number anywhere in any German city. And to act instead of just talking, talking. This is what once almost ruled the world!